After he saw the legendary haikyu (volleyball) player known as “the Little Giant” compete at the national volleyball finals, Shoyo Hinata began aiming to be the best volleyball player ever. However, in a sport in which tall athletes dominate, Hinata's height of 5'4” is considered too short. Now playing for Karasuno Public High School with his rival, Tobio Kageyama, Hinata does not believe that a player needs to be tall in order to play volleyball, especially when a player can jump higher than anyone else – as he can. As Haikyu! !, Vol. 9 (entitled Desire; Chapters 72 to 80) opens, Karasuno High's volleyball team prepares for the Spring Tournament. Thus, the players are super-excited to learn that the team is among several that have been invited to a series of practice games held in Tokyo and put on by the Fukurodani Academy Athletic Association. There is a problem, however; the event is held just before semester finals, and anyone who fails any finals test is excluded from participating in the practice games. Hinata, Kageyama, Yu Nishinoya, and Ryunosuke Tanaka are currently failing in at least one class. THE LOWDOWN: The Haikyu!! 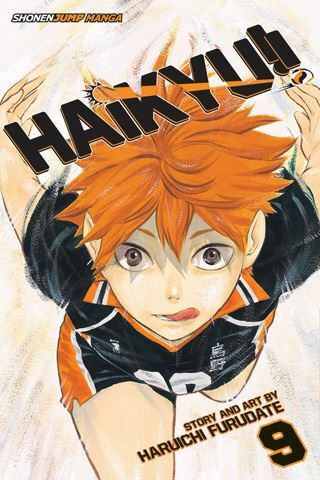 manga makes me interested in volleyball (haikyu) and reminds me of Tite Kubo's legendary basketball manga, Slam Dunk. Creator Haruichi Furudate should be and probably is flattered by that comparison, but he has also created a sports manga that is spirited in its own right. Haikyu!! Volume 9 is a slightly off-tempo graphic novel in the series. This volume is all about meeting new people, such as new manager-in-training, Hitoka Yachi, a teen girl with her own obstacles to overcome. There is also an emphasis on training and practicing, here, and a pivotal question is asked. What does Karasuno want to do to get better – have stability or to evolve? The questions certainly means more exciting chapters to come.